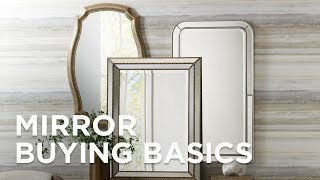 This vanity wall mirror will help you look your best. This pivot arm vanity wall mirror is great for applying makeup or grooming. Once mounted on the wall, it easily adjusts into the position needed. Chrome finish. 10x magnification on one side, regular mirror on back side. Design by Aptations. 9 1/2" wide x 11 3/4" high. 1 1/2" extension when fully retracted. Maximum extension of 11 1/2" from the wall. Glass only section is 7" wide x 7" high. Backplate is 3" wide. Round pivot arm vanity wall mirror from Aptations. 10x magnification on one side, regular mirror on back side. I needed a 10x magnifying mirror to install inside of a cabinet. what is the weight of this mirror? BEST ANSWER: Hi - This weighs approximately 1.75 pounds. BEST ANSWER: This model does not include a light. But, I have added a link below to our lighted makeup mirrors. We have looking for mirror like this for some time. Its classic styling goes well with our art deco era design. Elegant simplicity adds a tasteful ambiance to interior decor when this framed rectangular wall mirror is part of the mix. The power of mirrors to deliver function and style to interior decor is limitlessand this framed rectangular wall mirror is especially tasteful. Gatco Elevate Chrome 27 1/2" x 31 1/2"
This elegant beveled frameless rectangular wall mirror is offers a full face and upper body view while adding a sleek contemporary look to a bathdressing area or foyer. This large frameless oval wall mirror with beveled glass will add a sleek look to a bathdressing area or foyer.